By 1964, the trade journal Cashbox had listed her among the Top 10 Mexican folkloric acts in the U.S., along with Javier Solis, Jose Alfredo Jimenez, and Lola Beltran. Eventually, however, her solo career became secondary to her role as part of the growing Aguilar family act, which included her two sons, Antonio Jr. and Pepe Aguilar, the latter emerging in the 1990s as a star in his own right. 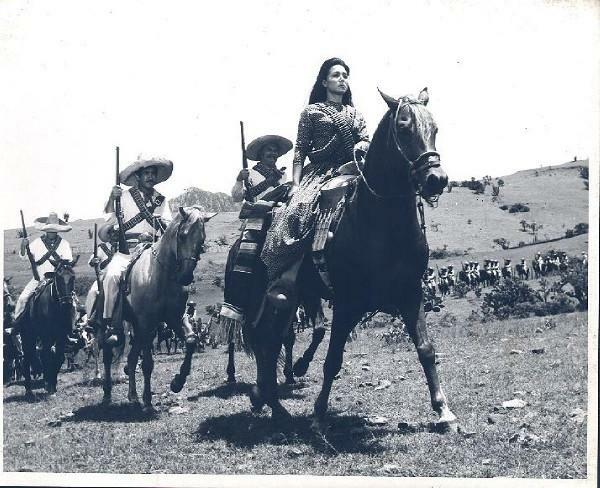 The boys became an important feature of the thrilling Aguilar rodeo show, as featured here in an undated segment from Raul Velasco’s classic television variety show, Siempre en Domingo. 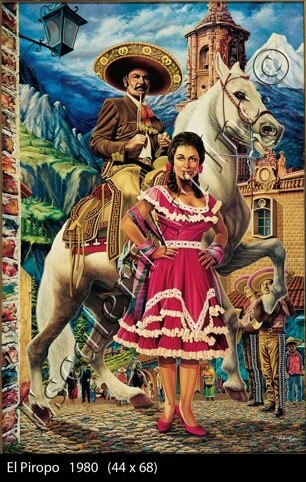 Flor Silvestre and Antonio Aguilar – nicknamed respectively “La Sentimental” and “El Charro de Mexico” – became international ambassadors of Mexican culture, something like the Roy Rogers and Dale Evans of rancheras. In 1997, when Silvestre was age 67, the family equestrian show broke box-office records by filling Madison Square Garden for six consecutive nights, as noted inThe New York Times. 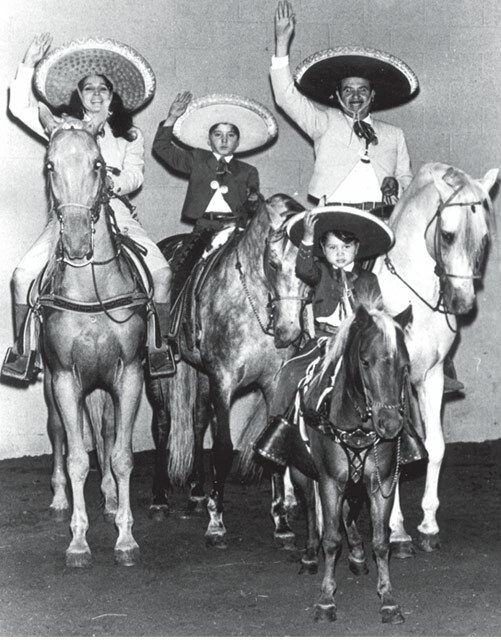 Formally called “Espectáculo Internacional Ecuestre de Antonio Aguilar y Familia,” the show’s popularity kept the family on the road much of the time, with tours throughout Latin America and the Caribbean. Silvestre and Aguilar pursued joint as well as parallel solo careers. They shared a love of singing, horseback riding, and making movies about romance and revolution. For more than half a century, they remained one of the most beloved artistic couples in Mexico, followed and admired right up to the death of Aguilar in 2007. She was born Guillermina Jiménez Chabolla on August 16, 1930, in Salamanca, Guanajuato. She is the third in a family of seven children, including her sister, ranchera singer Queta Jimenez, “La Prieta Linda,” who had a successful recording career of her own. At her mother’s insistence, the family moved to Mexico City when the aspiring singer was 13. Silvestre soon tried to break into show business with a bold move for a teenaged amateur. As the singer recounts in her documentary, one day she got the nerve to get up on stage at the Teatro del Pueblo (The People’s Theatre), a newly built venue near the center of the city, designed to make entertainment accessible to the masses. (The theatre was on the upper floor of the then-new Mercado Abelardo Rodriguez, which featured murals with socialist themes by students of Diego Rivera.) Silvestre asked to sing with the famed Mariachi Pulido, but the band director turned her down because she wasn’t a professional. Come back next week, the director told her, and he’ll bring a street mariachi (“del Tenampa”) to back her up. He did exactly that, and the girl’s performance was a hit. Thus, he christened her Flor Silvestre (Wild Flower), borrowing the title of a popular 1943 film starring Dolores del Rio. Sixteen years later, Silvestre and Del Rio would be co-stars in La Cucaracha, a critically acclaimed film about the Mexican Revolution. Silvestre launched her singing career with appearances on radio stations, such XFO. But her budding career got a big boost when she won an amateur singing contest sponsored by XEW, the leading station based in Mexico City. That led to local concert dates as well as contracts to tour Mexico and South America. But her big break came during her performances at the capital’s legendary nightclub, El Patio, where the singer was spotted by influential entertainment figures. Among them was film producer Gregorio Walerstein, who offered the 20-year-old her first film jobs. Silvestre made her movie debut as a singer in the 1950 film Te Besaré en la Boca (I’ll Kiss You On the Mouth), directed by Fernando Cortés. That same year, she got her first leading role in the Walerstein production Primero Soy Mexicano, co-starring comedian Joaquin Pardavé and singer Luis Aguilar, with music by prolific Mexican composer Manuel Esperón. The first year of the 1950s proved auspicious for Silvestre in many ways, personally and professionally. Silvestre earned a role in a musical review with a bullfight theme, ¡A Los Toros! written and starring journalist, bullfight commentator, and TV host Paco Malgesto (née Francisco Rubiales), who would quickly become her first husband. It was also in 1950, at the broadcast studios of “La W,” that Silvestre met the man who would eventually become her second husband, then known as Tony Aguilar. The two would act together in several films over the next few years – and divorce their respective first spouses – before getting married and launching one of the most successful careers of a married couple in Mexican music history. Silvestre’s first marriage to Malgesto had been very troubled. They had two children together, singer and actress Marcela Rubiales Jiménez and Francisco Rubiales Jiménez, a voice-over actor. Silvestre was only 16 when she had her first child, Dalia Inés Nieto Jimenez, a singer, dancer, and author who was born in Argentina. 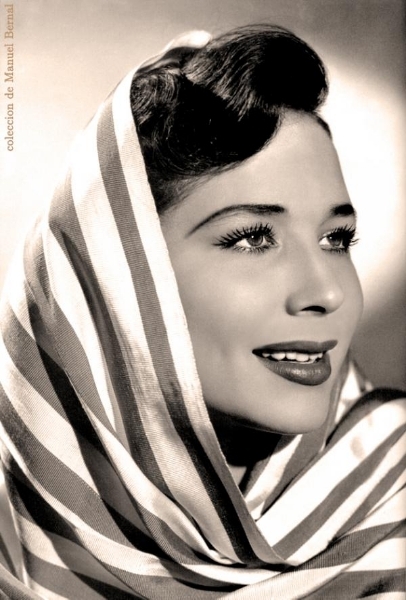 It was also in the early 1950s that Silvestre signed her first recording contract with Columbia Records, where she had early success with “Llorar Amargo” and “Oye Morena.” The Frontera Collection has eight of her Columbia recordings by top composers of the day. The majority of her recordings in the database are on the Musart label, a total of 79 tracks including several duets with her husband Aguilar. The couple first co-starred in the film “La Huella del Chacal,” released in 1956. Silvestre recalls that her romance with her co-star began that same year during the filming of La Ley de la Sierra. After shooting, he would take her on leisurely horseback rides, using the occasion when they were alone to give her a kiss on the back of the neck. They married three years – and five movies – later, just before the 1959 release of La Cucaracha, also known as “The Soldiers of Pancho Villa,” co-starring Mexican superstars Del Rio and María Félix. Silvestre was in her mid-80s and recovering from lung cancer surgery during the filming of the recent documentary. In the film, she seemed awash in nostalgia and longing for her late husband and partner. During a Q&A on stage at the ornate Los Angeles Theatre where the film made its local debut in March 2015, Silvestre was asked if there had ever been a war of egos between her and her famous spouse. Pepe Aguilar, now a full-fledged superstar, credits his parents with setting a positive example of professionalism on stage, and love between each other at home. He talks about his relationship with his mother in a segment on Univision’s Aquí y Ahora television news magazine, timed to coincide with the release of the documentary last year. Aguilar appears playful and affectionate with his mother, shown together at the family ranch in Zacatecas where she has lived since her husband’s death. In one scene, Silvestre is shown joining her son on stage, along with his own son and daughter, her grandchildren, who also sing. She says she is thrilled to get a chance to be on stage again, after so many years. And he says he does it for her.